A poster raised in Sahand stadium in Tabriz, Iran. Photo taken from Guney Azerbaycan Facebook page. Used with permission. One might think that a Middle Eastern powerhouse like Iran has little connection to a conflict between two former Soviet republics in the South Caucasus that began before the communist bloc even broke up. That would be quite wrong, however. Tensions over the breakaway Nagorno-Karabakh region that fell under Armenian control following a war with Azerbaijan which began in the late 1980s are never far from the surface in relations between the two countries. A March 29 meeting between Azerbaijan's President Ilham Aliyev and Armenia's Prime Minister Nikol Pashinyan was billed as among the most positive in recent years, but it was overshadowed almost immediately by the aggressive rhetoric of subordinate officials on both sides. In such a tense diplomatic atmosphere, powerful geopolitical neighbours have an important role to play. While the focus in this respect is often on traditional ex-Soviet power-broker Russia, Iran is also uniquely positioned to impact the conflict for better or worse. Present-day Azerbaijan's borders are a product of the Turkmanchay Treaty between Tsarist Russia and the Persian Empire that divided the country along the Arax River in 1928. According to this treaty, Azerbaijan became part of the Russian Empire while the lands to the south of the country became part of what is now known as Iran. As a result, the number of Azeris in Iran far outnumber those in the Republic of Azerbaijan that has a population of 10 million people. Presently there is no official data available on the number of this country’s Azeri population. But the Encyclopedia of the Stateless Nations (2002) put the number of Azeris in Iran at 18,500,000 people, or over a quarter of Iran's population. In Azerbaijan, many criticise Iran for having friendly ties and cooperating with Armenia, while Tehran, in turn, is wary of Baku's economic and military partnership with Israel. Although close religious and cultural ties bind Iranians and Azeris — they mostly share Shia Islam as a faith — Azerbaijan's government is strongly secular and suspicious of Iran's potential influence over conservatives in the Caucasus country. Inside Iran, millions of Azeris are not allowed to receive education in their own language. This fact is in notable contrast to the position of diaspora Armenians in Iran, who according to various sources number between 70,000 and 150,000 and are able to receive Armenian-language schooling there. As if these long-standing bones of contention were not enough, tensions between Armenia and Azerbaijan over Nagorno-Karabakh are also mirrored in discourse between the two communities. Anger over the disputed territory was on full display during Pashinyan's visit to Tehran at the end of February that culminated in a number of protests, mainly by fans of Tractor Sazi Tabriz FC, a football club based in the Azeri-populated northern Iranian city of Tabriz that has become a hub for Azeri activism in recent years. The protesters were particularly unhappy that Pashinyan had chosen to visit Iran on February 27, immediately after the anniversary of one of the bloodiest chapters in the six-year Karabakh war, known to Azeris as the Khojaly massacre of February 26, 1992. Many Azeris perceived Pashinyan's visit as a betrayal. Compounding this discontent was the fact that a poster that read “Karabakh is Armenia. Period” was raised during Pashinyan's meeting with Armenian diaspora representatives. 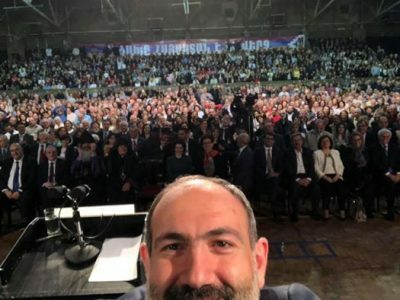 Armenian PM Nikol Pashinyan shared a selfie with Armenians in Iran in his Instagram account. The poster in the background reads: “Karabakh is Armenia. Period”. A total of twenty-eight supporters of Tractor Sazi were detained by Iranian police March 1, whilst leaving Sahand stadium following the Tractor-Sepahan game on that day. 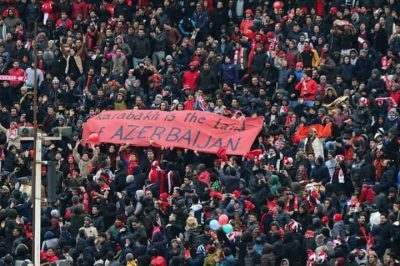 The arrests followed some 50,000 fans chanting the slogan “Karabakh is ours and will remain so” in the stadium where the Armenian flag was set alight. The scandal over Pashinyan's visit also reached Iran's legislature where an ethnic Azeri MP from Iran's Azeri-populated Urmia (Ormiyeh) region, Ruhulla Hazratopour, reiterated complaints over timing and called for Iran to clarify its position on Karabakh at a March 17 session. I am addressing the [Iranian] Foreign Affairs Ministry. What was the point of the Armenian Prime Minister’s visit to Iran on the anniversary of the massacre of Muslims in Khojaly, which caused a number of problems? As the leader has stated, and as the Azerbaijani people believe, Karabakh is the land of Islam. I am asking you now – what is the difference between Palestine and Karabakh? The Islamic Republic [of Iran] is an important Muslim country. We must play the role of a unifier in the region and protect all oppressed Muslims across the world. The MP finished his speech with a poem in the Azeri language. Typically, opposition to the Pashinyan visit was amplified on Facebook. One Facebook page used by Iranian Azeri activists is Gunay Azerbaycan (Southern Azerbaijan), which has around 20,000 followers. On March 3 the page carried a photo from Pashinyan's meeting with Iranian President Hassan Rouhani accompanied by graphic footage from the Khojaly massacre, where women and children were among more than 600 killed by Armenian troops, according to Azerbaijani authorities. The same page also posted a doctored photo from the Armenian prime minister’s meeting that showed an illustrated corpse of a small child laying in front of the two officials — another reference to the victims of Khojaly massacre. Of the dozens of Iranian Azeris that liked and shared this image, many were seemingly not born at the time of the Khojaly incident. But as Baku and Yerevan inch gingerly towards the negotiating table on Karabakh, the era of social media has lent fresh life to the conflict. Creative Commons LicensedAll content created by Global Voices is published under a Creative Commons Attribution-Only license. You are free to share, republish, translate or remix our stories so long as you attribute and link to Global Voices and the author clearly as the original source.